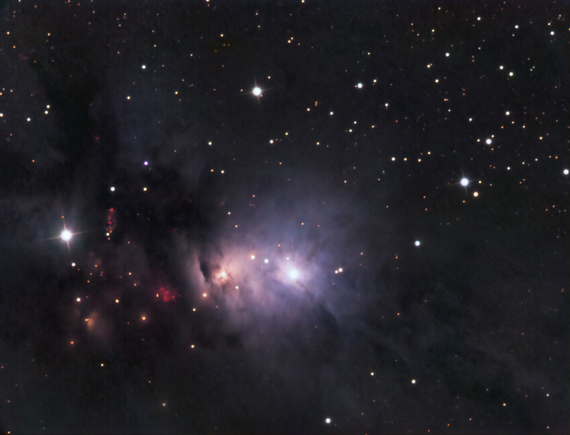 NGC1333 is located in Perseus and is a typical example of a reflection nebula. Stars forming within this region are less than 1 million years old, which is very young by stellar standards. The blue light emitted by the central star is scattered by the surrounding dust to create the charateristic blue color of the reflection nebula. Patches of Hydrogen gas in this region glow in the ember-like reddish brown areas. This represents Ha emission induced by ultrviolet radiation from nearby stars, Much of this region is filled with dense dust that obscures light from stars behind the nebula. Therefore, like NGC7023 and the Cocoon Nebula, this region is composed of all three type of nebulosity: reflection, emission, and dark.